In the October 2001, Felicia Bellman Tucker of Pensacola and Nancy Bellman McMillan of Mobile, granddaughters of Joseph Ralph Bellman (1870-1952), a native of Ocean Springs, and Elizabeth Missouri New Bellman (1876-1949), crossed the Atlantic in search of their Bellmann* roots. They spent two weeks in the northern Germany cities of Plön, Kiel, Schleswig, and Hamburg. Here the sisters met with German genealogists and historians who led them to their long desired dream of finding the parents and birthplace of Charles F.N. Bellman (1806-1868), progenitor of their Bellman family in America, and a pioneer settler of Biloxi. Their very successful journey and results are to be lauded and appreciated by all who seek knowledge of our romantic, but often-elusive past. *The original spelling of the family name in Germany, which is now spelled Bellman in America. The following is a brief description of the journey to Germany by Felicia B. Tucker and Nancy B. McMillan. Felicia B. Tucker wrote it for this article. We arrived in Hamburg and were met by my genealogical advisor, Kay-Uwe Gottorf and his wife. We were driven to Plön where we stayed in a quaint hotel on a lake. Plön is the town where Kay-Uwe Gottorf lives and he was going to be the one to help us get around Germany while we were there. The next morning he and his wife picked us up at the hotel and we drove to Schleswig where we were greeted by Mr. Thorsten Dahl, the spokesman for the Mayor. Mr. Thorsten Dahl was elected Mayor a few days after we left. Also Dr. Antje Wendt, the Doctor of History for Schleswig, told us all about our Bellmann ancestors, how they came to be in Schleswig to bring musical culture to that part of Germany by playing at the theatre for the opera. Dr. Wendt took us on a tour of the old part of Schleswig, which was originally a fishing village. We walked down the narrow cobblestone street to the St. Johannas Kloster where Carl Gottlieb Bellmann, Charles F.N. Bellman's father played the organ and wrote the anthem, "The Song of Schlewig-Holstein", with the help of a lawyer, M. F. Chimnitz. They arranged for a gentleman from the great church there to play on the same organ that Carl Gottlieb Bellmann had played the anthem that he wrote. The organ had been refurbished a few years before we went there. There is a statue to Carl Gottlieb Bellmann and Mr. Chimnitz in the park where they have a music festival every year. The song they wrote was written to prompt the citizens to rebel against Denmark so this part of the country could return again to Germany. We saw the house where Carl Gottlieb Bellmann and his wife lived and the house where Charles F.N. Bellman, our direct ancestor, was born. We traveled to Kiel via train to do some sight seeing and were shown around by a student that I had become acquainted with through my genealogical research. Kiel is where Charles F.N. Bellman's brother and sister taught music and had been proprietors of a music store. I could go on and on about our fascinating journey but I won't. I also have some really good photographs of the organ, statue, etc. It was a very eventful trip and so special. The German people went out of their way to tell us everything they could about our Bellmann family. They did not know that their famous musician, Carl Gottlieb Bellmann, had any descendants, as his other children never had any offspring. In addition to the knowledge that Felicia Bellman Tucker and Nancy Bellman McMillan have provided for Bellman family genealogists, the author would be severely remiss for not lauding the exhaustive research and publications of Nap L. Cassibry II (1918-2002). Cassibry's Magnus opus, The Ladner Odyssey (1988), and Early Land Settlers and Land Grants at Biloxi (1986) are pregnant with detailed historical and genealogical data of the Mississippi Gulf Coast. The latter work was particularly utilized in this essay. The progenitor of the Bellman family of Biloxi and Ocean Springs was Charles F.N. 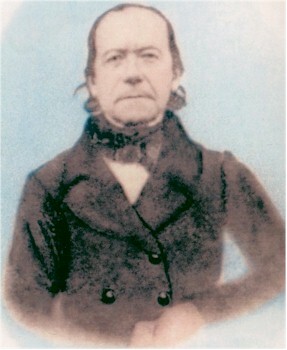 Bellman (1806-1868), an immigrant from Schleswig-Holstein, Germany. The name was spelled "Bellmann" in Germany. At least two other Ocean Springs families, Pabst and von Rosambeau, had their origins in this northern province of Germany, whose borders were often disputed with neighboring Denmark. Charles F.N. Bellman was born at Kiel, Germany on May 30, 1806, as Carl Friedrich Nicolai Bellmann, the son of Carl Gottilieb Bellmann (1772-1859+) and Friederica Christina Krause (1775-1860), the daughter of Otto Wilhelm Krause of Kiel. His birth was recorded in the Lutheran Church on June 7, 1806, at Schleswig-Friedrichberg. Carl G. Bellmann was a musician and composer from Muskau, in Saxony, now in eastern Germany. He was the composer of "The Song of Schlewig- olstein". Carl G. Bellmann and Miss Krause were married on December 9, 1800, in Schleswig-Friedrichberg. In addition to Charles F.N. Bellman, their other children were: Carl Adolph Eduard Bellmann, born November 10, 1801; Friederika Henriette Adolphine Bellmann, born May 25, 1803; and Carl Friedrich Fedor Bellmann, born December 29, 1811 and died May 29, 1874 in Kiel, Germany. (research of Felicia Bellman Tucker, March 14, 2002) Charles F.N. Bellman (1806-1868) was a pioneer settler of Biloxi, Mississippi. He arrived at Biloxi in 1835, and circa 1836, married Pauline Ryan (1815-1899), the daughter of Jacques Ryan (d. 1849) and Elizabeth LaForce (LaFauce). At Biloxi, Charles Bellman made his livelihood as a boarding house proprietor, druggist, and doctor. Bellman Avenue, which strikes north-south from East Beach Boulevard to Howard Avenue, in Biloxi is named for Charles F.N. Bellman. Charles F.N. Bellman and Pauline Ryan Bellman brought nine children into the 19th Century world: Theodora Bellman (1838-1901), married Louis L. "Toon" Ryan; Adolphine Bellman (1838-1893), married Moses Seymour (1838-1893); Charles W. Bellman (1841-1885), married Louisa Wilhemena Egan (1851-1881); Edwardine Bellman (1843-1921), married Benjamin F. Noel (1841-1910+); Harro Bellman (1847-1920) married Euphrosine "Frazine" Ryan (1852-1904); Bertha Bellman (1851-1932) married Ernest M. Beaugez (1862-1903); Ada Regina "Lida" Bellman (1854-1870+); Ralph Charles Bellman (1855-1899); and Pauline Josephine Bellman (1857-1933) married George W. McCary (1848-1925). In addition, Hanson Alsbury possessed Lots 2, 3, and 5 of the Widow LaFontaine Claim, Section 37, T7S-R8W. He also owned large tracts of land at present day Biloxi (Section 20, T7S-R9W) and D' Iberville. In the early 1840s, at Back Bay, now D' Iberville, Alsbury operated a large brickyard with Colin McRae. This operation would later become the property of William G. Kendall (1812-1872), the Kentucky born lawyer and U.S. Postmaster of New Orleans, who bought land at Ocean Springs east of Alsbury in 1846. The Kendall property is now owned primarily by the descendants of the Dickey-White-Scharr family and the Estate of G.E. Arndt Jr. In 1853, it was adjudicated in litigation titled, Charles Bellman, et al v. F.W. Frendenthal, Executor of the Estate of George Lewis Curtius, et al, in the Chancery Court of Harrison County, Mississippi that Charles F.N. Bellman's Biloxi tract did not have proper title, as Jacques Ryan, his father-in-law, had issued no warranty deed to him. Bellman's efforts to recover his investment in the schooner, Pauline, was dismissed. A personal judgment was assessed against Mr. Bellman in favor of the defendants for past due accounts owed to the firm of Curtius & Company, a New Orleans business owned by George Lewis Curtius and F.W. Frendenthal. This judgment applied only to Bellman and not the land and improvements, as they were deemed the property of the Heirs of Jacques Ryan. (Cassibry II, 1986, pp. 126-136) Apothecary As mentioned Charles F.N. Bellman was a druggist. Recommend to the public their choice assortment of Drugs, Medicines, Lancets, Syringes, Watch Crystals, Perfumeries, and a chemical preparation called C. Bellman Healing Rock for the cure of all sores, wounds, and scratches on horses and mules. Doctor's receipts will, as usual be made up with all possible precision, neatness and dispatch. Medical advice can always be obtained at the East end of the Plank Walk. Biloxi, Miss. His wife for the most part communicates in the French language, which he does not speak or understand. She also impeded his efforts to teach his children. I came to Biloxi in 1835 and Pauline and I were married in Biloxi in 1837. We have nine children. I once ran a boarding house and mercantile establishment, but lost them in two long and costly lawsuits. I deny that I ever failed in business. I now run a small apothecary and drug store and I have been a medical practitioner. I have insisted that our children be educated by the best people available in Biloxi at the time. I, myself, have instructed them, purchased books, paper, and all the supplies necessary to continue their education. I instructed them every night and all are literate and well educated as compared with the people and times here. Prior to 1870, Pauline Ryan Bellman had left Biloxi and relocated to Ocean Springs. In the 1870 Federal Census of Jackson County, Mississippi, she was a housewife and head of household. Harro Bellman, Bertha Bellman, Ada Bellman, and Pauline Bellman were domiciled with her. 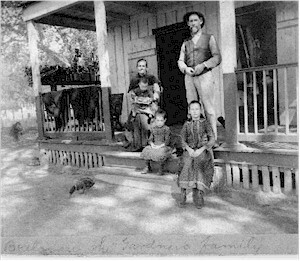 Two of Mrs. Pauline Bellman's married children, Theodora Bellman Ryan (1838-1901), the wife of sailor, Louis L. "Toon" Ryan (1837-1909), and Charles W. Bellman (1841-1885), a laborer and the spouse of Almina Bellman (1851-1881), a native of Hanover, Germany, resided on each side of her. The Bellman-Schmidt Cottage is situated at present day 505 Jackson Avenue and now in the possession of Patrick Mitchell. It apparently once belonged to Pauline Ryan Bellman and the original land deed was destroyed in the last conflagration, March 1875, of the Jackson County Courthouse at Pascagoula. C.E. "Uncle Ernie" Schmidt (1904-1988), in his Ocean Springs French Beachhead (1972) states that: It is known that the Widow Bellman took in a few pupils at the old house still standing at the northwest corner of Jackson and Cleveland. One of her pupils, Laura Coyle, remembered years later that Mrs. Bellman excused the class so they could go to the railroad to see the first official train go through. That happened on October 29, 1870. (p. 67) Laura Coyle (1857-1931) was the daughter of Franco Coyle (1813-1891) and Magalene Ougatte Pons (1813-1904). In 1874, she married Charles Ernest Schmidt (1851-1886), commonly called, "Handsome Charlie", a native of New Orleans and of German ancestry. Laura C. Schmidt was the grandmother of local historian, C.E. "Uncle Ernie" Schmidt. Like his father, Charles W. Bellman (1841- 885), Philip M. Bellman volunteered for military duty. The elder Bellman in 1861, had enlisted as a private in Company E, the "Biloxi Rifles", of the Third Mississippi Infantry C.S.A. During the 1898 Spanish American War, Phillip M. Bellman was also enrolled as a private by Captain DuMont at Scranton on April 27, 1898. He was a bugler and appointed company musician on July 5, 1898. Bugler Bellman was mustered out at Columbia, Tennessee on December 20, 1898, by Captain W.B. Homer, 6th Artillery. (Spanish-American War Service Record Extracts 1898-1899, No. 204). During the Spanish American War, M. Charles Bellman served with Company B of the Miss. Volunteers, 2nd Infantry Regiment. He was enrolled for military service by Captain Woods at Ocean Springs on June 4, 1898. Bellman was mustered in by Lt. Lockwood at Jackson, Mississippi on June 7, 1898. Private Bellman was mustered out of the volunteer army on December 20, 1898 at Columbia, Tennessee by Captain W.B. Homer. (Spanish-American War Service Record Extracts 1898-1899- p. 204). Edward Noel (1903-1967) married Sara Mary Esfeller (1906-1990). They were the parents of: Dorothy "Dot" N. Ross (b. 1926) married John Baptist Ross (b. 1927); Bette N. Ortega (1929-1988) married Ben M. Ortega (1927-1990); Mildred N. Cvitanovich (1932-1990) married Sam Cvitanovich; June N. Butler (1936-1996) married James Walter "Curley" Butler (b. 1934); and Joseph H. Noel (b. 1949) married Sandra A. Miller. It is interesting to note that the six sons of Noah A. Bellman and Williamina Catchot Bellman remained in the Ocean Springs area and had large families. They were: Ralph F. Bellman (1918-1999); Noah A. Bellman Jr. (1920-1999); Charles Arnold Bellman (1927-2000); James A. Bellman; Joseph Harro Bellman (1931-2000); and Thomas J. Bellman (1935-2007). Ralph Charles Bellman (1855-1899) was born at Biloxi, Mississippi on June 9, 1855. He expired at Ocean Springs, on October 16, 1899. In 1870, he was a resident of Ocean Springs living with William? Bang (b. 1848). (1870 Federal Census- JXCO, Ms.) Ralph C. Bellman's funeral was held in the Episcopal Church with the Reverend E. Thompson of Biloxi in attendance. He was eulogized in The Pascagoula Democrat-Star shortly after his demise, as follows: "for many years a resident of Ocean Springs, he was numbered among the best citizens, and was honored and respected by all who knew him. He was the loving tender son of his mother, caring for her in her old age, cheering and sustaining her until stricken with this fatal illness,"(The Pascagoula Democrat-Star, October 20, 1899, p. 3) No further information. The American State Papers, Volume III 1815-1824 Public Lands, (reprint Southern Historical Press: Greenville, South Carolina-1994). Nap L. Cassibry II, Early Settlers and Land Grants at Biloxi, Volume II, Special Issue No. 5, (Mississippi Coast Historical & Genealogical Society: Biloxi, Mississippi-1986). Darlene Jones Krohn, The Descendants of Jerome Ryan, (Krohn: Latimer, Mississippi-1995). 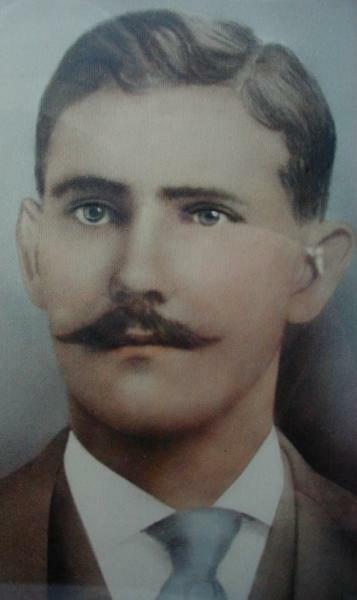 Jerome Lepre, Gulf Coast Genealogy-The Seymour Family, (Lepre: 2001-New Orleans, Louisiana). C.E. Schmidt, Ocean Springs French Beachhead, (Lewis Printing Company: Pascagoula, Mississippi-1972). Tim Wallis, Ross-Allen Families, (Wallis: Biloxi, Mississippi-1992). Harrison County, Mississippi Chancery Court Cause No. 30, "Pauline Bellman v. Charles Bellman", August 1858. Jackson County, Mississippi Chancery Court Cause No. 3616, "H.F.Russell, administrator of the Estate of A.P. Kotzum v. Mrs. H.C.Seymour, et al", October 1917. Jackson County, Mississippi Chancery Court Cause No. 4648, "Philip M. Bellman v. C.P. Martin and S.J. DeBlaeau operating The Ocean Springs Fish & Oyster Company", February 1925. The Biloxi Herald, "Ocean Springs", February 7, 1891. The Biloxi Herald, "City Paragraphs", March 31, 1906. The Daily Herald, "City News", August 22, 1907. The Daily Herald, "Phillip Bellman Dies", March 4, 1927. The Daily Herald, "Mrs. Beaugez Dies", December 21, 1932. The Daily Herald, "Ocean Springs Man Drowns As Boat Sinks", December 9, 1938. The Daily Herald, "Mrs. Marie Noel", January 16, 1956. The Daily Herald, "Herman E. Noel", September 15, 1967. The Daily Herald, "Percy Bernard Noel", March 17, 1977. The Daily Herald, "Charles Bellman", September 26, 1956. The Jackson County Times, "Local News Items", September 23, 1916. The Jackson County Times, "Local News Interest", November 20, 1920. The Jackson County Times, "Local and Personal", September 15, 1923. The Jackson County Times, "R.L. White", March 3, 1928. The Jackson County Times, "Joseph Edmund Brou", November 17, 1934. The Jackson County Times, "Local and Personal", September 5, 1936. The Jackson County Times, "The Column", August 12, 1939. The Jackson County Times, "B.J. Noel Dies", April 25, 1942. The Jackson County Times, "Gloria Mathieu Fatally Shoots Winson Noel", January 26, 1946. The Ocean Springs New, "Local News", May 14, 1910. The Ocean Springs News, "Eagle Point Oyster Company advertisement", November 24, 1915, p. 12. The Ocean Springs News, "Local News", March 23, 1916. The Ocean Springs News, "Ocean Springs Fish & Oyster Co.", March 30,1916. The Ocean Springs News, "Lt. Cmdr. Brou Funeral Is held; Victim of Crash", October 2, 1958. The Ocean Springs Record, "Phyliss Bellman Burke", September 27, 1970. The Ocean Springs Record, "Open House Guests", August 22, 1985. The Ocean Springs Record, "Birthday celebration", March 19, 1987. The Pascagoula Democrat-Star, "Died", March 25, 1892. The Pascagoula Democrat-Star, "Ocean Springs News", March 25, 1892. The Pascagoula Democrat-Star, "Sudden Death of Moses Seymour", January 13, 1893. The Pascagoula Democrat-Star, "Ocean Springs Locals", February 17, 1896. The Pascagoula Democrat-Star, "Ocean Springs Locals", October 10, 1899. The Pascagoula Democrat-Star, "Ocean Springs Locals", February 2, 1900. The Progress, "Local News Interest", February 20, 1904. The Sun Herald, "Brou stays agile, wins five medals at Games", July 18, 1997. The Sun Herald, "Inez Virginia Bellman McLain", October 8, 2004, p. A-7. The Sun Herald, "Thomas J. Bellman", November 18, 2007, p. A-14. The Sun Herald, "Mr. Edward J. 'Eddie' Bellman", November 8, 2009, p. A-12. The Sun Herald, "Bellman kept Elvis alive on the Coast", November 8, 2009, p. A-13.